I'll say this again just in case you're a new reader..... I'm a big fan of the World Baseball Classic tournament. I usually root for Cuba (My dad is Cuban) and Mexico (My mom is Mexican) because my USA team doesn't take it seriously. WBC is back next year. I was there in 2006 and 2009. I saw games in Phoenix, San Diego and Los Angeles. Good times. 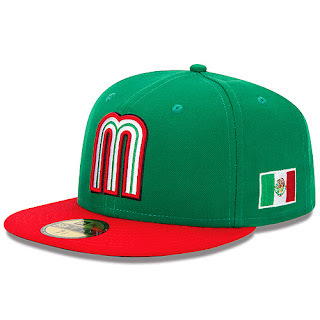 The WBC will be back next year and MLB is already selling hats. Guess which hat I just bought? 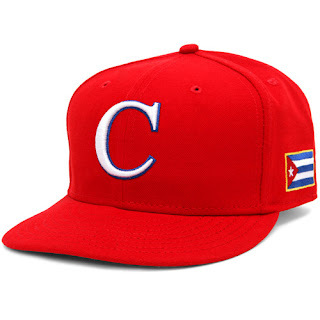 I already have a Cuba hat from the 2006 tournament so I wasn't interested in getting another one. It does look different but the 2006 version is better. I try to convince myself in purchasing the Mexico hat but I just don't like it. The colors don't bother me but I think the "M" looks weird. My wife is from Nicaragua and I came close in buying this hat. I show it to her and she tells me "That's not the Nicaraguan flag". Say what? Major fail from WBC and MLB. But glad that Nicaragua was invited to this tournament. They will be playing later this month to see if they will qualify for next years game. Good luck Nicaragua! So I guess I'll buy the USA hat. Right? The logo looks nice. Love the USA flag. Glad it's not a red hat. But wait a minute! What's this? What a great looking hat! Love the blue. The "I" looks great. The Star of David looks fantastic. In honor of my dad's Jewish heritage, I bought this hat. Team Israel. I had too. It looks great. I'll get the USA hat before the year ends. Click here to view all the hats. I think all the hats look dope! Represent your flag! Vamos México, ra ra ra!!! Dude, that Israel hat looks awesome. I may pick it up as well. the Nicaraguan flag used on the cap, just as the Spanish flag used on it's cap are the "Civil" flags of the countries rather than the "state" flags of the countries. so it is not necessarily a fail by New Era or WBC, but rather that both countries have two flags used for different purposes. That Nicaraguan cap is really nice. Let your wife know that the Nicaraguan flag is the civil flag.